I DECIDED while we were on holiday that I’m going to write a travel bucket list. to keep track of all the places I’d like to see, and all the things I’d like to experience. And as with all good lists, I’ll start with something I can instantly tick off – cycling in Holland. Before visiting Amsterdam a few years ago I had an idea that cycling was popular in Holland, but you can’t imagine just how many bikes you’ll see, especially lined up outside the train station – or how many will zip past as you step off the pavement. I wasn’t confident enough to attempt hiring bikes there! 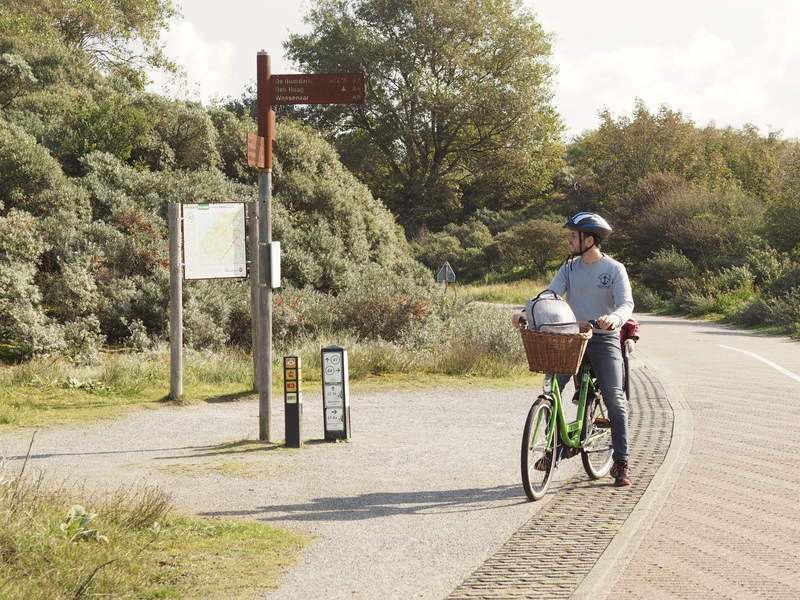 Being further away from the city, at Eurocamp’s Duinrell parc in Wassenaar, seemed like the perfect opportunity to get pedalling, and hiring bikes turned out to be the best idea we had all week. 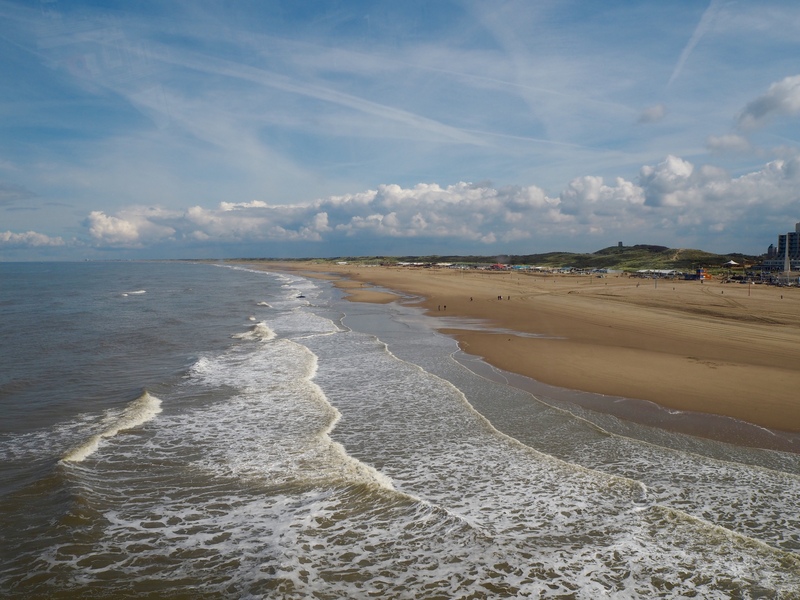 We had two choices – cycle to the beach at Wassenaar, which was about 5km / three miles away, or take the 12km / 7.5 mile route to Scheveningen. Us being us, we decided to go big. 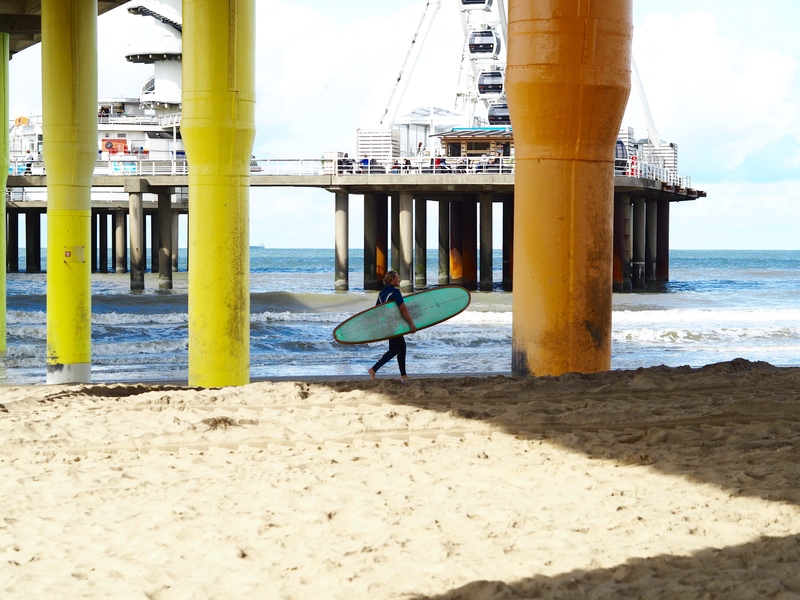 Scheveningen it was. We got kitted up, I convinced Stew that a basket was a necessity (for carrying his rucksack, not for photos…), mastered the lack of handbrakes and set off. Stew and Santi were like pros, having had much more practice than me and Ezra as they often go for bike rides at home. I had an initial wobble, having not been on a bike for a ridiculously long time and being nervous having Ezra on board. As he’s still so little, he had a baby seat on the front of my bike rather than the traditional back child seat. It turned out to make no difference to my balance, and he was happy as Larry being able to see where we were going. He was like a little lord drinking his milk and munching away on baguette while I did all the hard work! As expected, the cycle paths were nothing like at home. They were well maintained, clearly signposted, and are properly separated from the road. Oh, and they are so well used – we saw groups of teenagers, older couples, a cycle team and even a woman taking her dog for a walk while on her bike (not recommended as her dog went to say hello to another one and she fell off!). 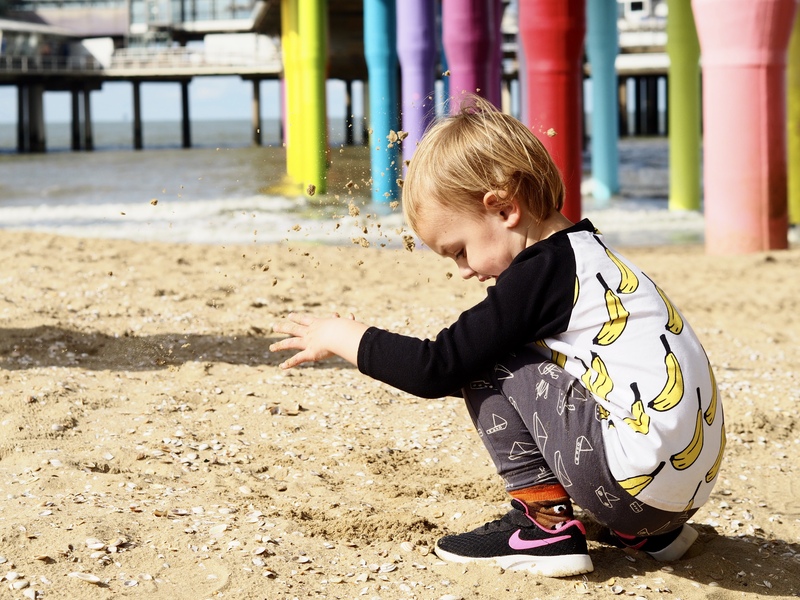 We took our time cycling through the dunes and stopping off for a snack along the way. We passed the odd pond, giving Ezra a chance to practice his quack quack-ing, and spotted the shining office blocks of The Hague in the distance. 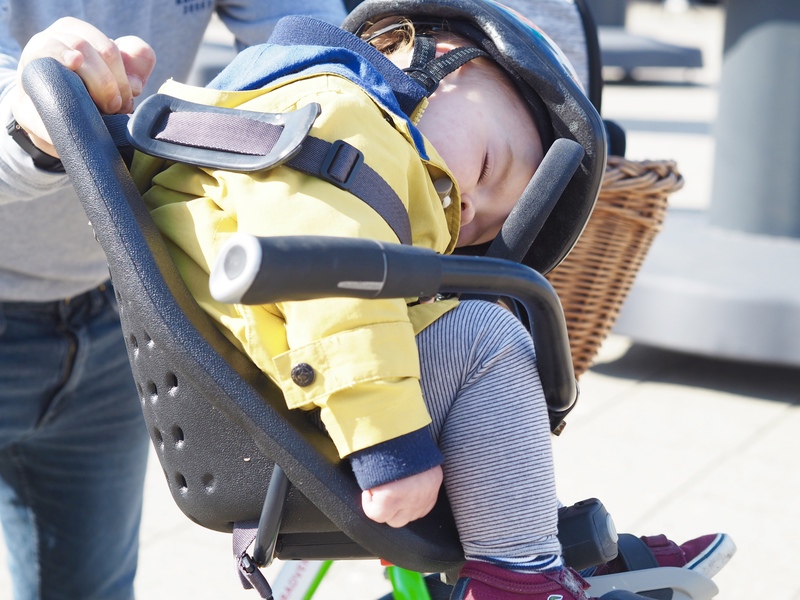 As we got into Scheveningen and hopped off our bikes to find the pier, we realised that Ezra had been so comfortable in his seat that he’d decided to take a nap … look at his little sleepy face! And look at that view! 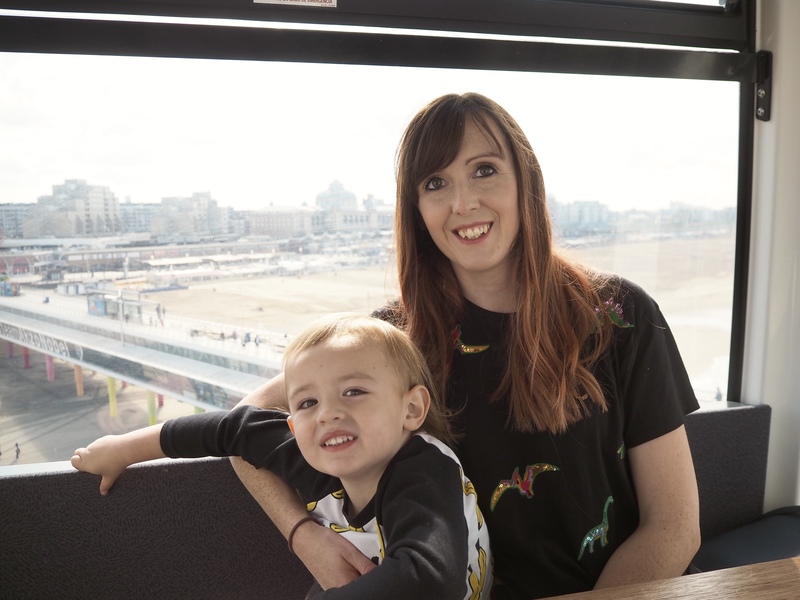 After convincing Santi that he didn’t need to go on the trampolines on the beach – there were free ones at the Eurocamp parc – we walked up to the pier and decided to go on the ferris wheel. 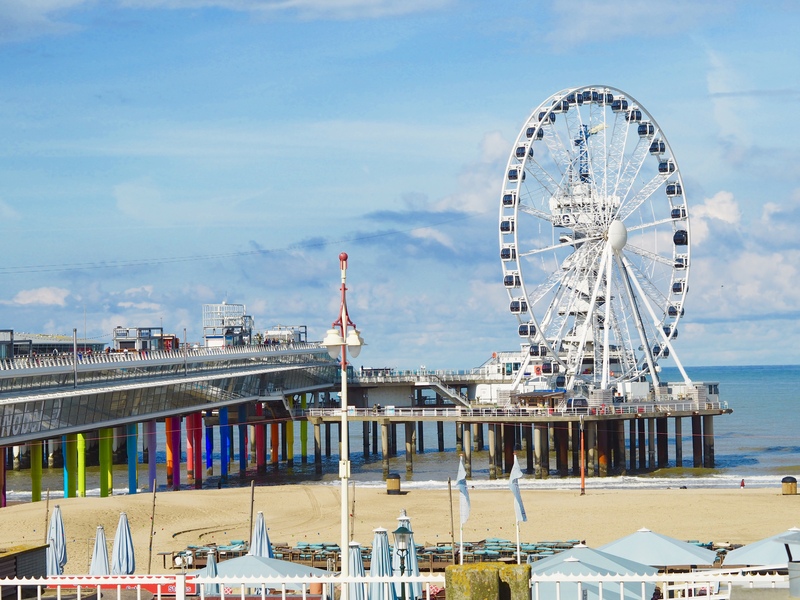 It took a while to walk along the pier to get to it as we kept stopping to watch people on the huge zip wire overhead … I was quite tempted to have a go, but I don’t like heights! The ferris wheel cost around 18euros and was well worth the price. We were on there for a good 15/20 minutes and had a fab view over the beach along to a lighthouse near The Hague. I can imagine it would be really busy in the summer, but there was no queue to get on, and only one other pod was filled. 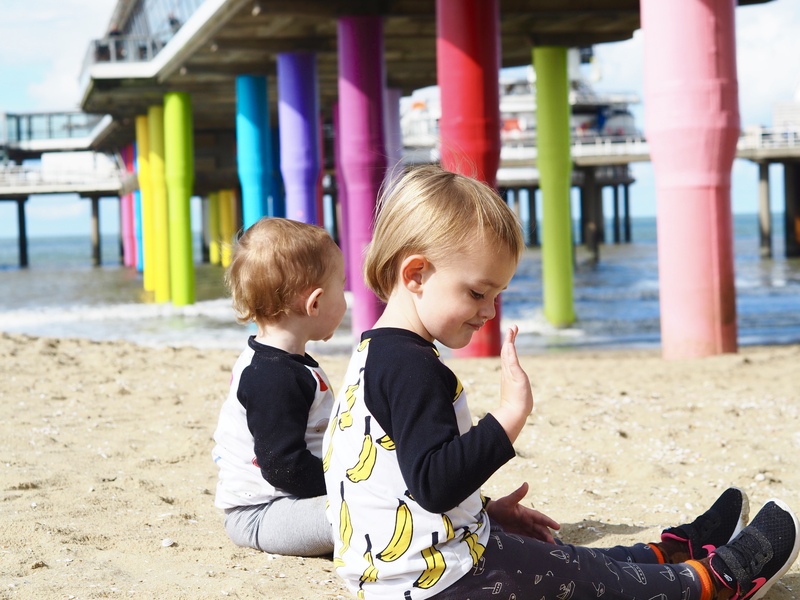 We enjoyed the chance to rest our legs, and the boys entertained themselves spotting boats on the sea and playing with the air conditioning buttons. We were quite peckish getting off, and there was plenty of choice of what to eat inside the pier – gourmet burgers, vegetarian dishes, ice cream etc. Being by the sea, we thought it would be a nice idea to get some chips and sit outside to eat them. 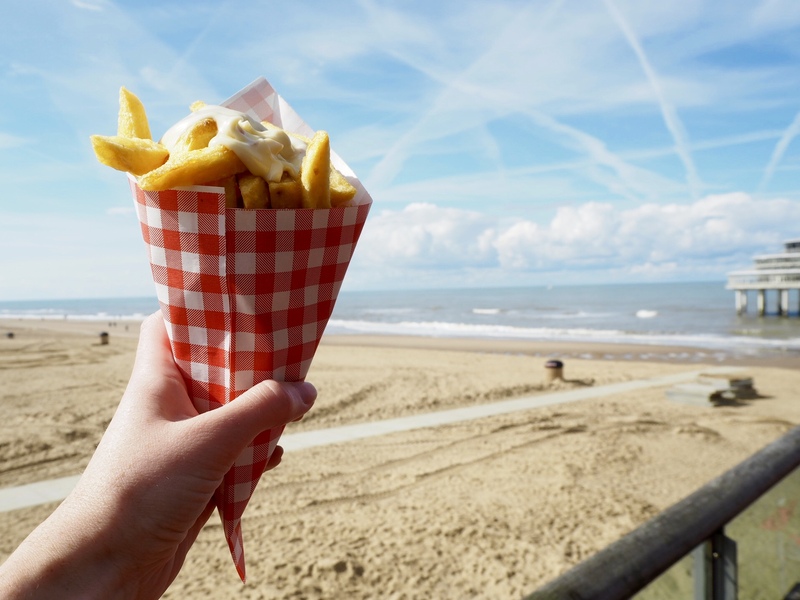 We found a stall where you could buy a metre of chips, but we stuck with just three portions – one plain, one with tomato sauce, and seeing as we were in Holland, one wth mayonnaise. Yum! Looking over the beach it was so peaceful (apart from the shouts that Ezra was pinching Santi’s chips, of course), and there was hardly anyone in sight. 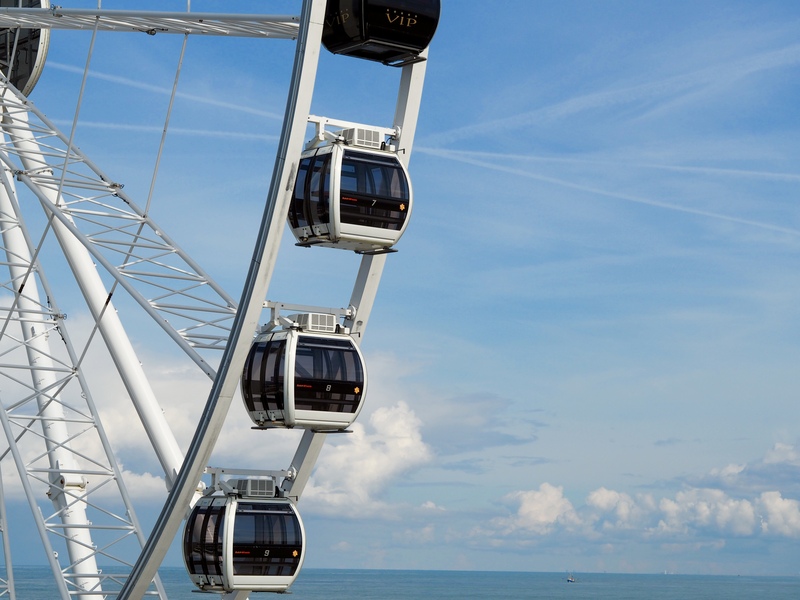 Scheveningen is Holland’s most famous seaside resort, and looks like it has really good facilities in the summer – there are bars and cafes all along the front, play areas, and even a spa overlooking the sea. It must be so different during peak season to when we visited. 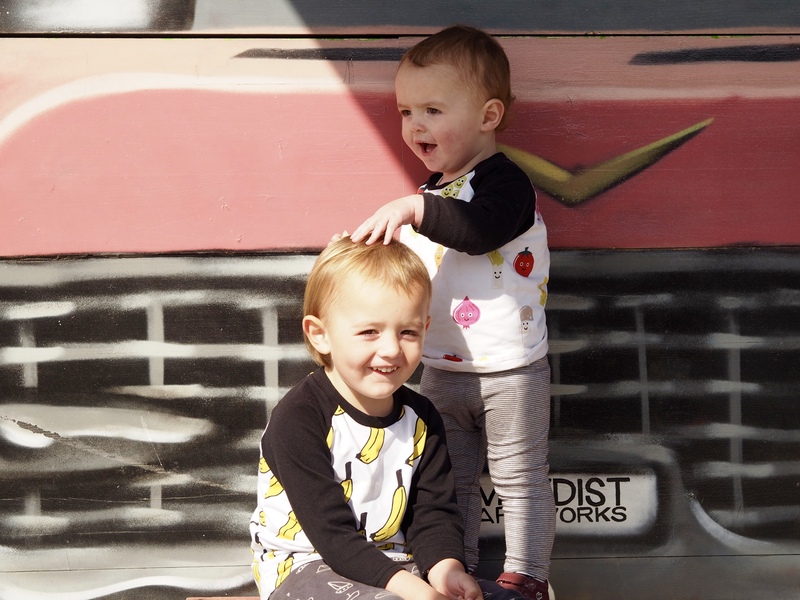 After our oh-so-healthy lunch it was time for dessert, so we hit up the nearest ice cream shop … one for Santi, and one for Stew, which Ezra promptly stole. He developed a clever knack of stealing our ice creams during this holiday! 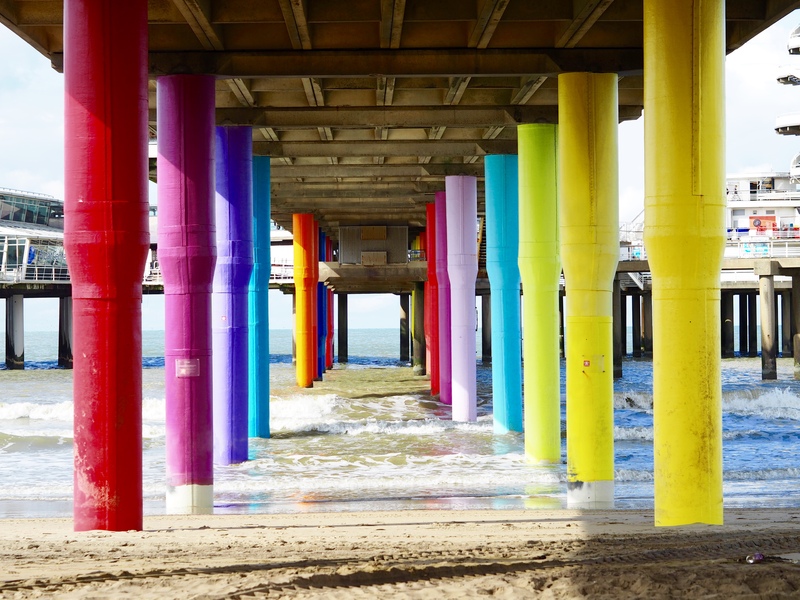 I wanted to get some photos under the pier because the poles were all painted different colours and it looked so pretty … I might have gone a bit overboard! It would have been lovely to stay for longer, and we could have got some really lovely sunset photos on the beach, but the seven mile cycle back was on our minds. A quick stop off in the shop for some drinks and snacks and we hopped back on the bikes. I thought I’d be sneaky and buy a couple of bars of Milka for me and Stew in case the boys fell asleep after all the fresh air, but as soon as I stepped out of the shop Santi spied the purple wrapper and asked every two minutes if it was time for a break so he could have some. We somehow cycled back in just over an hour, and it was just in time as I was running out of songs to sing to keep Ezra occupied. There are only so many verses of clap clap un dau tri you can manage while cycling! 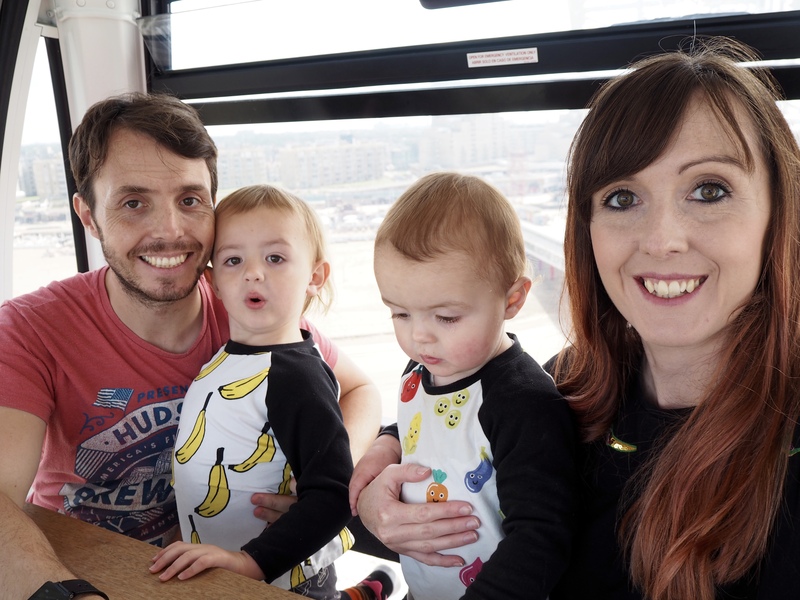 Oh, and when I mentioned that we thought the boys would fall asleep I had no chance … after being the passengers and not the pedallers they were wide awake! We really loved our little biking adventure, and I think it was both me and Stew’s favourite day of the week. I’d highly recommend cycling in Holland if you ever visit … I’m even considering buying a bike now (with a basket for flowers and fresh baguettes, of course!). 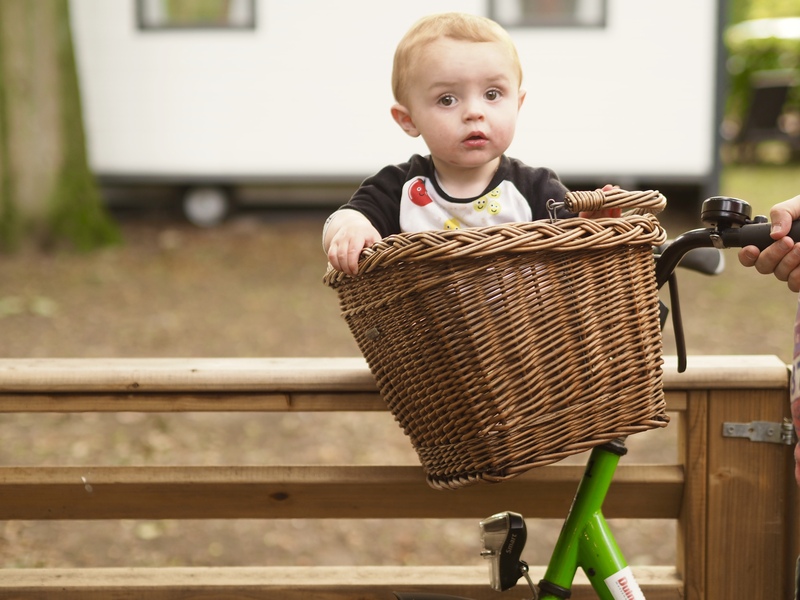 We hired our bikes on site at our Eurocamp. 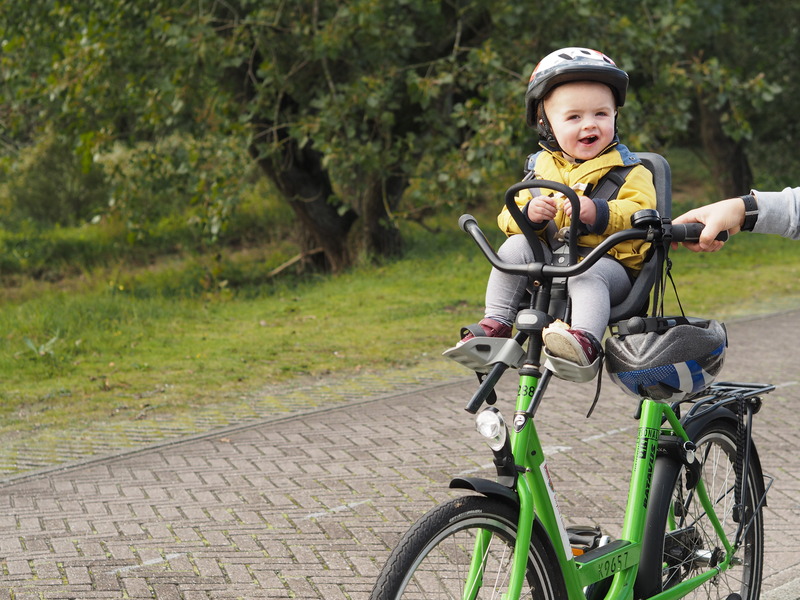 We paid 35euro for two bikes, a toddler seat, baby seat, basket and four helmets for a day – there was a discount if you hired them for the week which is worth it if you have the weather! If you drive to your holiday you can take your own bikes. 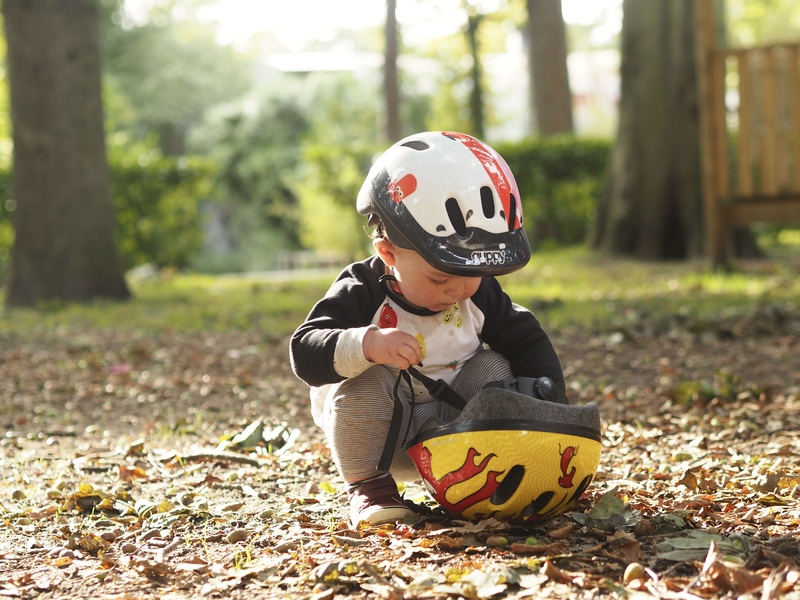 Helmets are not compulsory in Holland, but recommended for safety. We took the Wassenaar to Scheveningen cycle route, which you can join from the Eurocamp entrance. It’s mostly flat, but there were a couple of hills along the way. Choosing Delft over Amsterdam: A good call? ← Saving a life, or risking ours? Did I do the right thing?